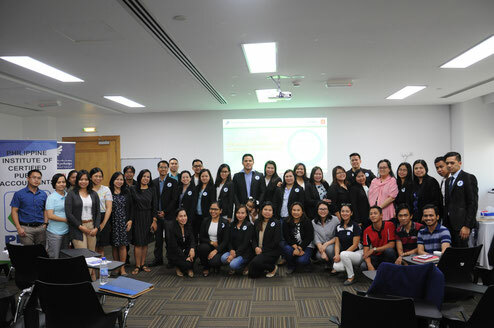 Under the auspices of the Philippine Embassy in the United Arab Emirates (UAE), the Philippine Institute of Certified Public Accountants (PICPA) Abu Dhabi Chapter held its annual general assembly (GA) and election of officers on the 22nd day of June 2018, at the CME Hall, Universal Hospital (UH) in Abu Dhabi. The event was filled with united minds, hearts and souls of the PICPA Members with the intent of improving the competency and quality, not just of the organization as a whole, but also of the individual PICPAns. Huge part of the GA were the two technical sessions: (1) “Latest updates to International Financial Reporting Standards (IFRS) 15 – Revenue from Contracts with Customers & 16 – Leases” and (2) “Rebuilding our Financial Goals”. The first technical session was delivered by Mr. Shefeek Salim, Senior Manager of Nasser Auditing Services and Business Management where participants have learned the core “five-step model” for revenue recognition. The speaker also discussed the main objectives of the IFRS updates; these are, to attain a more robust framework for addressing revenue recognition issues, remove inconsistencies, improve comparability across companies, industries and capital markets and improve disclosure requirements to name a few. The second technical session, which was conducted by Mr. Alfred Geronimo, Senior Specialist – Financial Audit at the Central Bank of the UAE, brought to the attendees a renewed interest and inspiration to start rebuilding their financial goals. Mr. Geronimo effectively awakened everyone’s desire to attain a financially independent status by presenting first the main reasons that hinder an individual’s financial freedom like unwise spending, excessive debts and credit cards, investment without due diligence and some more. The speaker concluded the session by showing a guide on how to make a “blueprint” of desired financial goals. Attendees to the technical sessions earned a handful of Continuing Professional Development (CPD) units which is a very important requirement for CPA PRC ID renewal. The election of officers for the year 2018-2019 was facilitated by former PICPA Presidents Mr. Willard Maquirang and Ms. Marybeth Junio. The end of the gathering showcased the beginning of the new leadership as the newly elected officers held their first meeting spearheaded by Mrs. Maria Sharina De Dios, the 2018-2019 PICPA President. Great bonuses to the event were the Health Awareness Talk about Lifestyle Modification by Dr. Dexter De Castro coupled with the Free Medical Check-up by the UH and the CPD Updates by Mrs. De Dios. PICPA Abu Dhabi endeavours to make every PICPAn’s life be like accounting, that is – everything in balance.